A unique, one-of-a-kind, Fantastic Biblical Rug - Old masterpiece of all silk Persian rug made in Kashan. The stories of Old Testament is hand-woven by a Jewish artist named, Yahudi. 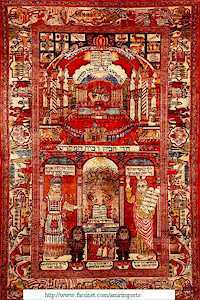 A predominant jewish family prayer rug was brought back from Iran right after the revolution. With fine Hebrew woven stories, it is a fantastic museum piece and a must for serious collector. Call for a large color picture of the rug (US$10.00), price or to set up appointment to see the rug if really interested. Description: Fine 100% silk hand woven. Go To ... [Main Page] [Yahudi Persian Rug] [Persian Rug FAQ] Send your comments and Questions to bazaar@farsinet.com.